The knowledge of the extent of local adaptation is essential for forest reproductive material transfer, designing gene conservation programs and measures for mitigation of the ongoing climate change. A common methodology for assessing selection underlying local adaptation is the comparison of differentiation at neutral markers (measured by F ST) against quantitative traits (measured by Q ST). We investigated differentiation in phenology, height and diameter growth, and parameters of photosynthesis and water regime in a widespread European broadleaved tree, European beech (Fagus sylvatica L.). As the assessment of Q ST requires known pedigree structure of the tested populations, it was approximated by the coefficient of phenotypic differentiation P ST. For all phenology traits, especially budburst timing, there is a strong and reliable evidence of local adaptation as indicated by P ST > F ST. On the other hand, P ST was generally smaller than F ST for most growth and physiological traits, but the evidence for uniform selection or canalization acting at genes underlying these traits is generally absent or weak. Possible heritable basis of phenological differentiation is discussed, and implications for the current EU legislation on forest reproductive material are drawn. Handling editor: Dr. Jarmo Holopainen. The online version of this article (doi: 10.1007/s10342-015-0910-2) contains supplementary material, which is available to authorized users. The provenance experiment has been established through the realization of the project European Network for the Evaluation of the Genetic Resources of Beech for Appropriate Use in Sustainable Forestry Management (AIR3-CT94-2091) under the coordination of H.-J. Muhs. The experimental plot Tále was established by L. Paule. 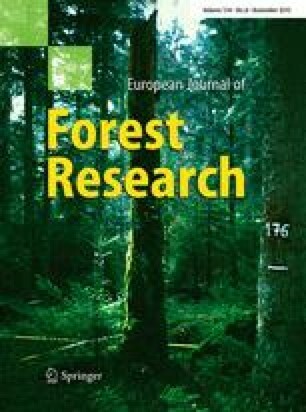 Collection of field data was partly accomplished within the COST Action E52 Evaluation of Beech Genetic Resources for Sustainable Forestry, coordinated by G. von Wühlisch. We express our gratitude to G. Baloghová and K. Gömöryová for technical assistance with nSSR genotyping, T. Priwitzer, M. Macková, E. Pšidová and J. Majerová for the help with the measurements of physiological parameters, and K. Willingham for checking the language. The experiment was supported by the grant of the Slovak Agency for Research and Development APVV-0135-12 and the grant of the Slovak Grant Agency for Science VEGA 1/0218/12.